The latest iteration of Louie Anderson’s routesetting competition series will land this September 5th & 6th at Earth Treks in Rockville, Maryland. The Setter Showdown is a two-day competition and community event designed to bring setters of the region together to find out who is “best” at what they do. 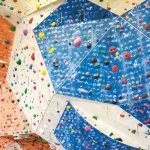 During the competition setters will be tasked with designing three boulder problems, one each of easy, medium, and hard difficulty from a pre-allocated set of holds. The setters will set their problems under the observation of three technical judges, who will keep on eye on their safety, efficiency, creativity and other aspects of routesetting. The technical judges for this event are Anderson himself, CBJ editor & National Chief Setter Mike Helt, and Earth Treks Head Setter Ward Byrum. The setters will not be judged solely on their technical abilities. 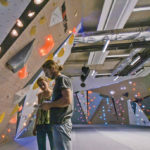 They will also be judged by actual climbers, professionals and Earth Treks members who will critique the climbs’ creative value as well as aesthetics. For this east coast version of the Showdown, Anderson decided to make it a two-day event so as to accommodate for more time for the climbers to effectively judge. It also allows for more party! 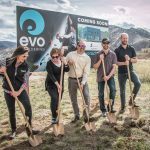 “The climber judging will involve a greater number of climbers this time and the entire day will be more of a festival environment with a large Vendor Village, shoe demos, live music, BBQ and beer in the evening,” Anderson told CBJ. 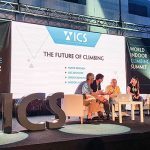 The Showdown was born earlier this year when Venture-based Kingdom Climbing wanted to launch their brand to the public and do it in a way that would have an impact on the setting scene. Held at The Factory in Orange, California The Kingdom Games was a one-day event that brought together 24 of Southern California and Arizona’s best setters for a friendly competition and community meet-up. After the Games, Anderson decided to evolve the idea into a continuing circuit of events. 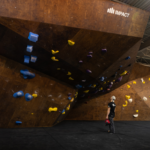 As stated on the event website, “Rebranded as the Setter Showdown, the circuit plans to present a handful of events each year, and will rotate to different gyms around the United States and abroad.” Anderson also signed up new hold sponsors, Climb-It and Kilter, in addition to Kingdom Climbing, to add diversity for the competitors. Adidas Outdoor and the Gear Co-Op have also signed up to be title sponsors of the Showdown. Setter Showdown – Earth Treks Preview from Louie Anderson on Vimeo.